The Food Alphabet and More: FREE Cheeseburger at McDonald's!!!! 1. Promo is extended until June 20, 2016. 2. The new user must download the McDo PH app, which can be downloaded from the App Store (for iOS users) and Play Store (for Android users). The app can also be downloaded by visiting http://moo.ph/mcdoph. 3. The New User may enter the CHEESEBURGER promo code after successfully signing up. 4. Entering of the CHEESEBURGER promo code will be a one-time event only—upon registration, and if process is skipped, user can no longer enter the promo code. 5. 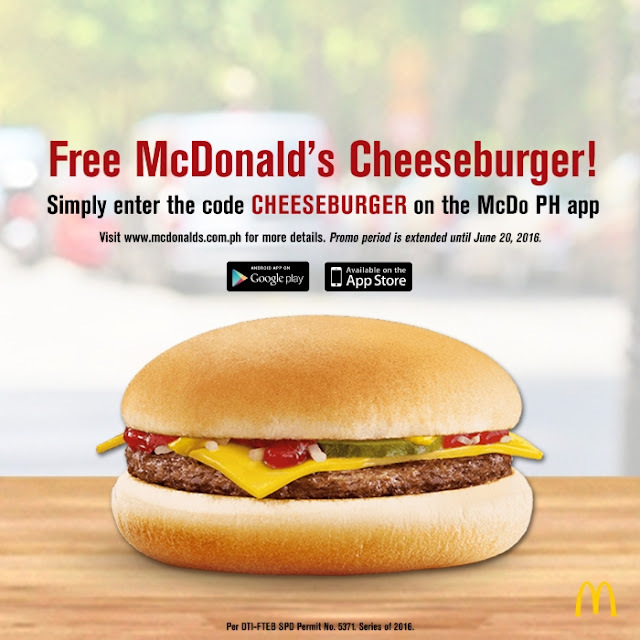 Once the promo code has been successfully entered, the new user will be rewarded a Free Cheeseburger Coupon which will be located in the Coupons page of the app. 6. To claim free cheeseburger, user must add the coupon in his cart through the app.